A hilarious fantasy sequel to The Dark Lord of Derkholm, set at the University after the 'fantasy world' tours have stopped, and centred around 6 students (one a Griffin) and the bumbling new University Head Wizard. From the 'Godmother of Fantasy', Diana Wynne Jones. 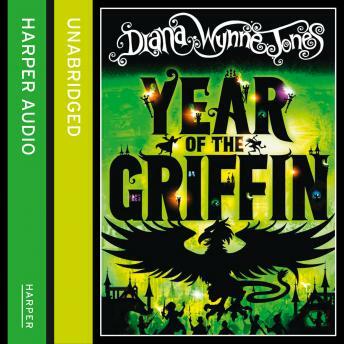 The Year of the Griffin is the sequel to the Dark Lord of Derkholm, set in the same world several years after the abolition of commercial 'fantasy world' tourism from our world. The University now aims to produce competent wizards to repair the damage caused by the tours. It's broke, and out of date in terms of what it teaches. The new head, Wizard Corkoran, is obsessed with becoming the first man to visit the moon so is mostly preoccupied, and the new faculty is mostly inexperienced.